Looking at the glimpses of heaven that we get in the Bible, it is obvious that the primary activity there is worship. So, if God’s will is going to be done on earth as it is in heaven, that absolutely must include worship. Tom Kraeuter has been teaching about worship for more than 30 years. Now you can glean from his study and experience right in your own living room. This 5-session DVD is designed for small groups — home groups, Bible study groups, Sunday School classes, etc. — to help people understand worship from a biblical perspective. The Participant’s Guide (order separately below) offers thorough outlines for each section, as well as discussion questions to help drive home the lessons. And, given the teaching style and the questions, we can pretty much guarantee some lively discussion after each lesson. Lessons range from 19 – 27 minutes each. 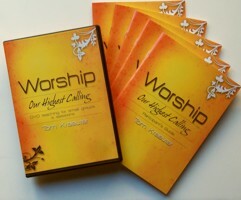 Be sure to order enough of these for each person in your small group to have one. It includes thorough notes for all the teachings and great discussion questions for each section. This Particpant’s Guide is the key to making this DVD study successful. You know you’re going to want your entire congregation to go through this, so why not just order 50 copies and get the best possible price? DVDs plus 5 Participant’s Guides — 1/3 off!